Winx is racing as well as at any stage of her extraordinary career - and the statistics prove it. The world's best racehorse might be a rising eight-year-old but she retains her speed, competitiveness and dominance. The champion mare scored her 31st consecutive and a world record 23rd at Group 1 level in the Chipping Norton Stakes at Randwick on Saturday when she overran a brave Happy Clapper in one of the most memorable weight-for-age clashes for many years. Winx's winning time was 1m 33.27s - a new race record and the fastest time she has ever run for 1600m in 12 attempts. This effort came Winx set a race record in the Apollo Stakes first-up when she ran the Randwick 1400m in 1m 20.88s, the first time in nine races she has gone under 1m21s for that distance. Race times are subject to many variables including tempo and track conditions but it is clear age has not dimmed Winx's speed and explosive powers of acceleration. Winx is going so well she could probably race on for another season but her connections have indicated the great mare will be retired to stud at the end of her autumn campaign. WHERE TO PLACE WINX, THE AUTUMN SUN? Trainer Chris Waller has not closed the door on a possible race program change for Winx next start. Winx is widely expected to follow her usual autumn race campaign and contest the Group 1 $1 million George Ryder Stakes (1500m) at Rosehill on Golden Slipper Day, March 23. She has already won this race three years in succession. But Waller has suggested there is a "10 per cent chance" he may switch Winx to the Group 1 $700,000 Ranvet Stakes (2000m) the same day, pointing out the mare has won the last three Cox Plates off a 2000m lead-up race. The other problem for Waller is which race to start his crack colt The Autumn Sun on Slipper Day. 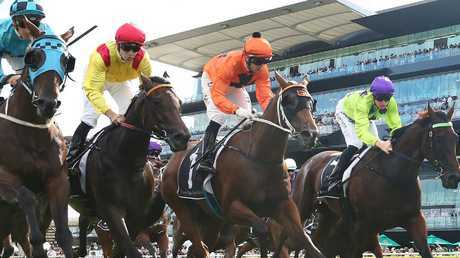 Waller could run The Autumn Sun, early favourite for the $3 million Doncaster Mile (1600m) at Randwick on April 6, in either the George Ryder Stakes, Ranvet Stakes or the Group 1 $600,000 Rosehill Guineas (2000m) at the Golden Slipper meeting. It is worth noting Waller prepared D'Argento to win last year's Rosehill Guineas before a luckless fourth to Happy Clapper in the Doncaster. A clash between Winx and The Autumn Sun in the George Ryder Stakes would be the most-hyped race of the Sydney autumn carnival. 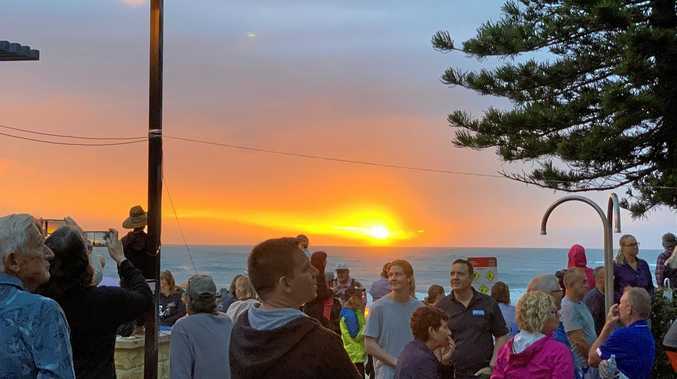 However, the connections of The Autumn Sun are reluctant to take on Winx, conceding their colt is unlikely to beat the mighty mare. 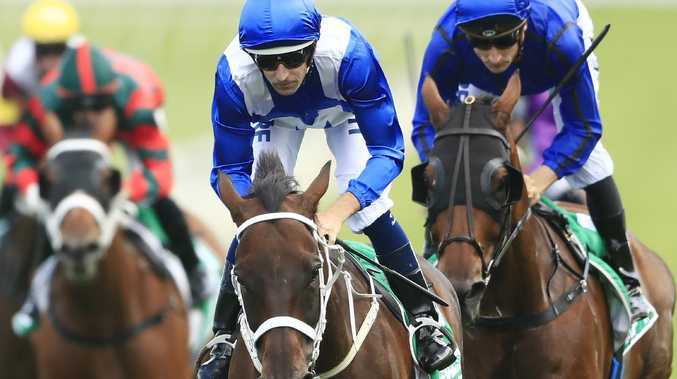 Winx, the Golden Slipper and Jimmy Barnes - it's a stellar "trifecta" and should attract racegoers to Rosehill Gardens in record numbers for Slipper Day later this month. If there was one disappointing aspect of last Saturday's Chipping Norton Stakes meeting, it was the attendance with "only" 14,831 trackside to watch Winx's world record bid. Perhaps the road closures around the Moore Park-Randwick precinct due to the mardi gras dissuaded some from going to the track but Winx surely deserves a bumper attendance for Golden Slipper Day. It seems likely that Royal Randwick could attract a record modern-day crowd for Winx's farewell race, the $4 million Queen Elizabeth Stakes (2000m) on April 13 as the early hospitality, members and public ticket sales are tracking similar to The Everest last spring when more than 43,000 came through the turnstiles. Nakeeta Jane, an outstanding winner of the Surround Stakes, is poised to take on The Autumn Sun in the Group 1 $1 million Randwick Guineas (1600m) next Saturday. Trainer Mark Newnham said he will wait until Wednesday morning to make a final decision but is leaning to backing up with Nakeeta Jane after she overcame a wide run to score a last stride Surround Stakes win. Fundamentalist made a brave attempt to lead throughout in the Surround only to be collared on the line and her trainer David Hayes is also looking closely at a Randwick Guineas start. The Randwick Guineas meeting is loaded with highlight races including the Group 1 $500,000 Canterbury Stakes (1300m), where the likely runners are Trapeze Artist, Kementari, Le Romain, Pierata, Prompt Response and Brutal. Dual Everest winner Redzel returns in the Group 2 $500,000 Challenge Stakes (1000m) where his opponents could include last year's Golden Slipper winner Estijaab, Sandbar and evergreen sprinter Ball Of Muscle. The Slipper lead-up races will be crucial with crack colts Time To Reign, Tassort, Yes Yes Yes, Rome and Strasbroug likely for the Group 2 $300,000 Todman Stakes (1200m) while Magic Millions winner Exhilarates is the headline act for the fillies division, the Group 2 $300,000 Reisling Stakes (1200m) where she could meed Tenley and Evening Slippers. Kerrin McEvoy has an outstanding book of rides for Randwick include The Autumn Sun (Guineas), Brutal (Canterbury Stakes), Redzel (Challenge), Strasbourg (Todman) and Exhilarates or Tenley (Reisling). 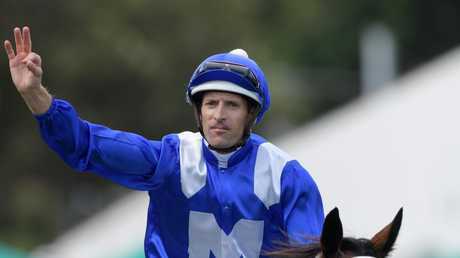 Hugh Bowman, who rode his 90th career Group 1 winner on Winx in the Chipping Norton, won't be at Randwick on Saturday. Bowman's heading to Flemington instead where his rides include Osborne Bulls (Newmarket Handicap), Avilius (Australian Cup) and Deep Chill (VRC Sires Produce Stakes). With apologies to Winx I have to give the run of the day to Happy Clapper. It's not easy taking on a champion but the Clapper really went out of his comfort zone and had a red hot go and went down with flying colours. I don't recall ever seeing a crowd acknowledging a beaten performance but the punters aren't dills and to see them respect a beaten performance was heartening. Young Import Desert Path really showed he has a future in Australia with a much improved display at his second start here. He never got the cart into the race that he needed and the smarties that got the good odds were unlucky not to collect. His future here is promising. Zalatte took on the cream of the crop first- up in the Surround Stakes and she passed the test with flying colours. I know it's that time of year that we tout everything an Oaks type but she definitely has legitimate credentials. I don't need to explain every individual ride by Blake Shinn on Saturday, just have a look at the replays he just was at the top of his game and made no mistakes.